We are pleased to announce the winners of the Sting.com 25 Days Countdown! 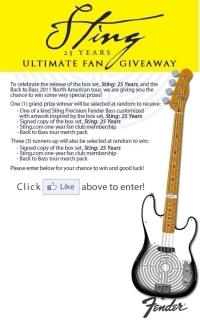 The grand prize winner, George Rapitis, will receive a unique, one of a kind Sting Signature Series Precision Fender Bass customized with artwork inspired by the Sting: 25 Years box set, plus an autographed copy of the box set, a Sting.com fan club one-year membership and a Back to Bass tour merchandise pack. The three runners up, Jen Ashlin, Sheila Barnes and Denise Holder will each receive a signed copy of the Sting: 25 Years box set, a Sting.com fan club one-year membership and a Back to Bass tour merchandise pack. Congratulations to all of our winners and thank you again to everyone who participated in the 25 Days Countdown! Enter to win tickets for Sting's Back to Bass tour! On October 27, Sting will perform at the Tower Theatre in Philadelphia and we're giving away a pair of tickets to two randomly selected fans. 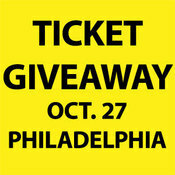 Enter to win by October 26 at 11AM EDT using the form below…it's that easy!